My smartphone is my Swiss Army knife. I use it for a hundred different things—making calls, playing videos and games, taking photos, and controlling my TV. Now, a slew of new products are letting me use my smartphone to control the very house I live in. There’s not yet an app that will let me order up “Tea. Earl grey. Hot.” a la Captain Picard on Star Trek, but we’re getting close. You don’t have to suffer the chill of a cold house to save on heating bills in the winter. 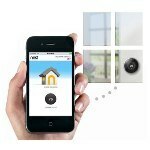 With the Nest thermostat ($249 on Nest.com), you can turn the heat up remotely with your iPhone or Android phone so your home is just the right temperature when you arrive. Over time, Nest learns your habits so it can make adjustments automatically. It also has sensors built-in so it knows when your away and can go into energy-saving mode. Ever wonder what your pet does all day? You can check in anytime when you set up the Foscam FI8910W Wireless IP Camera ($94.67 on Amazon.com). You can log in to view video from your iPhone, Android phone or Blackberry, and even operate the camera—panning, tilting and zooming in on whatever catches your eye.